TV show dates: October 2, 2017 — February 26, 2019. Performers include: Stephen Moyer, Amy Acker, Natalie Alyn Lind, Percy Hynes White, Sean Teale, Jamie Chung, Emma Dumont, Blair Redford, Coby Bell, and Garret Dillahunt. 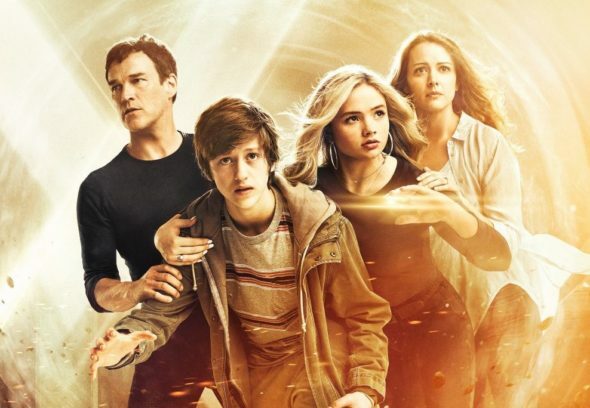 From creator Matt Nix, The Gifted TV show is set in Marvel Comics’ X-Men universe. The series centers on Reed and Caitlin Strucker (Moyer and Acker) and their teenaged children, Lauren (Lind) and Andy (White). Prosecutor Reed Strucker is an ordinary man living in extraordinary times. Although he has been tasked with trying those mutants who hurt humans, and works hard to meet his responsibilities, he is not blind to the fact that Sentinel Services considers itself above the law. Reed’s wife, Caitlin, is a healthcare provider and an average wife and mother of two teens. This couple’s world changes forever, when they learn their children possess the X-gene and have already manifested the superpowers associated with it. Andy is something of a loner and a convenient target for the bullies at his school. When they take their cruelty too far during a school dance, Andy’s telekinetic abilities explode in a destructive display of force. His sister, Lauren, who has been concealing her ability to pull molecules together, comes to his rescue. Soon thereafter, this family goes on the run to protect the children from a government run amok — propelled by fear and prejudice. Agent Jace Turner (Bell) and Sentinel Services are soon hot on their trail. In their quest to survive, the Struckers seek help from an underground network of mutants. Leading up the pack is John Proudstar aka Thunderbird (Redford). He’s a gifted tracker with a deep connection to his surroundings. Marcos Diaz aka Eclipse (Teale) has the ability to absorb and control photons. Drawing on the experiences of his dismal past, he helps his fellow mutants escape to Mexico. Meanwhile, with her magnetic powers, Lorna Dane aka Polaris (Dumont) is able to manipulate metal. Thanks to her ability to open portals, Clarice Fong aka Blink (Chung) possesses the power of teleportation. When the series opens, Thunderbird, Polaris, and Eclipse have tracked her down and are trying to help her escape the clutches of the authorities. Then there’s Roderick Campbell (Dillahunt) who is working as a mutant researcher for Sentinel on a contract basis. His true mission and real motives are difficult to discern and seem to be morally ambiguous, at best. The Gifted explores themes related to family, loyalty, and what it means to belong. Reeva prepares to carry out her plan for the Inner Circle, but not everyone is on the same page. Reed struggles to manage his powers and the family realizes that without enough of the serum, it’s only a matter of time before he completely loses control. Frustrated and egged on by Benedict Ryan, Jace and the Purifiers are on the attack, but for Jace, things aren’t as black and white as they once were (courtesy of FOX). What do you think? Do you like The Gifted TV series? Should this TV show have been cancelled or renewed for season three on FOX? Well that does it for Fox! With the Gifted and Gotham cancelled, looks as though there’s nothing else to watch on that channel. Please renew The Gifted. I thoroughly enjoy this series. It is captivating. Please renew The Gifted!!!!! I love this show and love all the characters! I don’t get attached to a show very often and this is my favorite! I love this show. We need to know what they do next. PLEASE RENEW THE SHOW!! I LOVE THIS SHOW! !